Round Midnight is Thelonious Monk’s most famous composition. 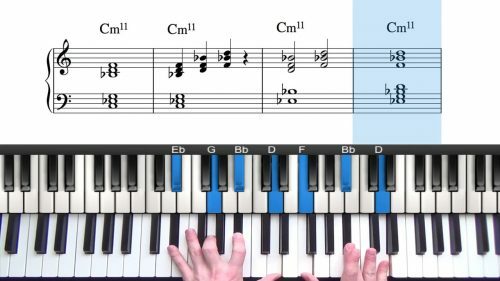 Written in the key of Eb Minor, the 6 flats in the key signature take some getting used to but the tune contains lots of interesting chord changes and harmonic movements. Round Midnight is actually the most widely recorded jazz standard written by a jazz musician. 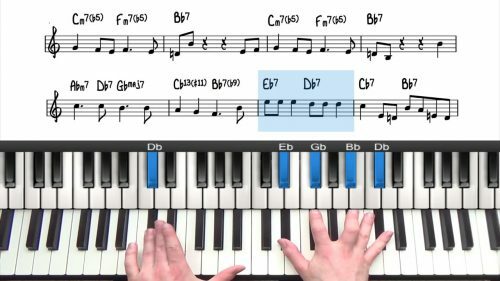 In this tutorial, we explore lots of minor harmony so you should be confident with minor 251s and there variations. We also introduce some interesting suspended chord movement over the dominant chord at the end of the bridge. The sus13 voicing is a great choice of voicing over dominant chords with the root in the melody. Find the relavent lessons on minor chords and sus chords in the recommended lesson section below. You should be listening to jazz as much as possible. Make note of anything you like in mm:ss format and then revisit it in your practice time to transcribe the notes and rhythms. Check out the course on Transcription for more information on this area.